As you can see, this leaves little time for sitting. Whatever parish you are in, when in doubt, stand in prayer—yet remaining sensitive to not drawing attention to oneself, or blocking other’s participation in the service. 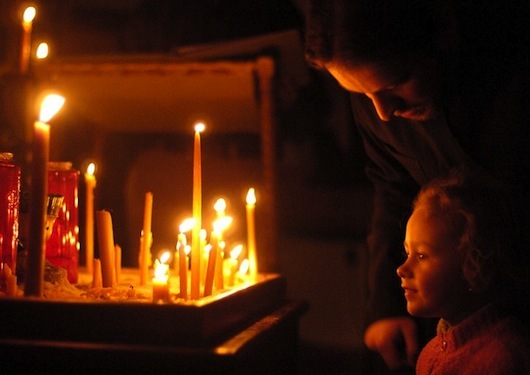 Lighting candles is an important part of Orthodox worship. We light them as we pray, making an offering to accompany our prayers. Orthodox typically light candles upon entering the church, after venerating the icons. If a service is already in progress, and the candlestands are up front, it is a good idea to wait until after the service to light candles so as to not distract others from prayer, nor draw undue attention to oneself. Certainly parents should have ready access to the doors to take small children out if they are distracting or need a short break—for this reason the doors are to be accessible, i.e. let us avoid the temptation to congregate around the back candlestand and door, and challenge ourselves to move forward into the Nave. For times when it is inappropriate, unless necessary, to walk out of the service see “Standing vs. Sitting”. Lipstick looks terrible smeared on icons, crosses, the communion spoon, and the priest’s or bishop’s hand. Hand-written icons have been ruined by lipstick; and even though the cross or spoon can usually be cleaned after everyone venerates, it’s not very considerate to those who follow. What is the answer? If one insists on wearing lipstick to church, blot your lips well before venerating…. Point of consideration: God, Whom we alone come before in Liturgy, is not impressed with our external attractiveness, but with the adorning of our souls in humility, good works, and piety. Besides being disrespectful toward God, Who is present, it is distracting for others who are striving to pray. This rule includes all services of the Church, whether it be the Hours read prior to Divine Liturgy, or the priest hearing Confessions after Vespers. It is best to save conversation for the fellowship hall, inviting guests next-door for a visit. The proper way to greet a bishop or priest is to ask his blessing and kiss his right hand. How do you do this? Approach the bishop or priest with your right hand over your left (palms up) and say “Father (“Master,” in the case of a bishop), bless.” This is appropriate and traditional, rather than shaking their hands. When you receive such a blessing it is Christ Himself who offers the blessing through the hand of the priest or bishop. Who of us would not want all of Christ’s blessings we can get? There was a time when people put on their “Sunday best” to go to church. By contrast, there is today not an insignificant backlash against such propriety. Many contemporary churches innocently flaunt a “come as you are”; pitch as part of their advertising ploy. Though God does not demand us to “dress up” for Him (as though He is in any way impressed by our external appearance), the fact is, as followers of Christ in all areas of our life, we should offer Christ our “best” and not just our “leftovers” (c.f. Cain and Abel). Our dress should always, especially at church, be becoming of a Christian. We dress modestly, not in a flashy way that merely brings attention to ourselves. Children: Only young children are allowed to wear shorts to church – but not athletic shorts, cut-offs, or “spandex” (which are not appropriate for adults either). Tennis shoes that “light up” should be avoided, especially for altar servers, in that they draw attention away from prayer. “This Bud’s for you!” and other similar T-shirts are a definite out. Women: Dresses are certainly most appropriate, and are to be modest (i.e. tank tops, short skirts, and skin-tight dresses serve only one purpose contrary to the aim of being in Church). Slacks and pant-suites are an accepted part of our culture, however tight jeans and spandex type wear are never appropriate. The wearing of head coverings is traditional and encouraged, but not enforced. Men: Men are also to dress modestly as befits a follower of Christ. While coat and tie are by no means mandatory, shirts with collars and clean pants/slacks are not too much to ask. Again, shorts are to be avoided, particularly on Sunday morning. The above guidelines can be adjusted for services outside of Divine Liturgy, i.e. Vespers. It is better to be in church for prayer, than to not come at all for mere lack of a change of clothes – as may be the case when coming from a Saturday outing, or workparty, etc. Finally, this is not a call for someone to go out and buy a whole new wardrobe just to be a part of the Church! Use your best judgment and good taste when it comes to Church. You don’t go to church to be seen by people – you go to present yourself before, and to worship, God. ⁃ To cross: when you hear one of the variations of the phrase “Father, Son, and Holy Spirit”; before venerating an icon, Gospel, or Cross; when blessed with an icon, Cross, Gospel, or Chalice; entering and exiting the temple; when passing before the Altar. ⁃ Not to Cross: (only bowing of the head): when blessed with hand (as in “Peace be unto all”), or censed. In receiving a blessing from a bishop or priest one does not make the sign of the Cross beforehand. “In this way ought we to distinguish between reverence toward holy things and toward persons” (Jordanville Prayerbook). Parents often bring little snacks for young children to keep them occupied and quiet in church. This is fine as long as it is discreet and quiet and the parent sees to cleaning up any leftovers. By the time a child is 3-4 years old this will most likely be unnecessary. And by the time a child reaches age 7 they are mostly capable of fasting the entire morning of Holy Communion (or at least cutting back on breakfast). For those children who do require snacks during service, please refrain from feeding them, even a bottle, while in line for Communion, as they ought to come to the Holy Mysteries without food already in their mouths. Chewing gum is never appropriate in church. After taking Communion, at the end of the Divine Liturgy, and at Vespers/Vigil with a “Litya” or “Blessing of Bread”, it is traditional to eat a piece of holy bread or antidoron—the left-over bread from which Holy Communion was prepared and various commemorations made. While antidoron is not the Body and Blood of Christ, it is still blessed bread, and as such, we should take precaution to eat it carefully so that crumbs don’t fall to be trampled underfoot. Monitor the children as they take the antidoron, teaching them to eat respectfully.